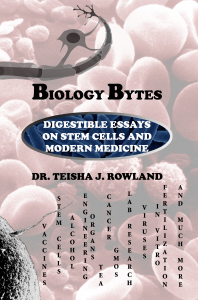 In Biology Bytes: Digestible Essays on Stem Cells and Modern Medicine, author Dr. Teisha J. Rowland discusses the history and latest scientific advancements in these fields of science, and many more. With a specific focus on issues that we increasingly encounter in the modern world around us, Dr. Rowland explores cutting-edge science through essays that can be easily digested: complex scientific concepts are broken down into key points based on the latest discoveries, technical jargon is clearly explained, and the impacts of these discoveries on our lives is explored. This book includes comprehensible explorations of a wide range of topics, including different types of stem cells and treatments they may be used in, the development and impact of in vitro fertilization (a technique responsible for over 1% of U.S. births today), how and why GMOs are made, the creation of vaccines to fight cancer, and fascinating food science behind delectable drinks such as beer, wine, and tea. This book is a 2014 Next Generation Indie Book Awards Finalist. 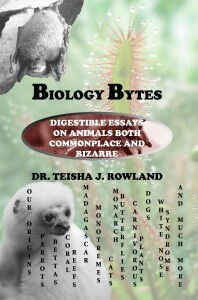 In Biology Bytes: Digestible Essays on Animals Both Commonplace and Bizarre, author Dr. Teisha J. Rowland discusses the critters that are all around us. From ones close to us, such as our pets, to distant considerations, like the insects that make our silk fabrics, or unfamiliar amphibians facing extinction, a range of creatures are explored in essays that can be easily digested: complex science is broken down into key points, jargon is clearly explained, and, where applicable, how the reader can take action is summed up. This book covers a wide range of topics, including “unusual” creatures (such as monotremes and photosynthetic sea slugs), everyday critters (like pesky garden snails and captivating monarch butterflies), the evolution of our species and the Neanderthals (who our ancestors bred with as recently as 37,000 years ago), the recent decline of honey bees, coral reefs, and others, and explanations for stories of encounters with fictional “monsters,” like vampires and zombies.